Warner Bros. Interactive Entertainment today released LEGO® DC Super-Villains: SHAZAM! Movie Level Pack 1. The downloadable pack adds a new level and DC characters inspired by the magical, Warner Bros. Pictures film, SHAZAM! in cinemas nationwide today. For Season Pass holders, SHAZAM! Movie Level Pack 1 will be available on 5thApril, and SHAZAM! Movie Level Pack 2, which also adds a new level and characters will be available on 23rd April, 2019. The Season Pass, which adds six level packs and four character packs, is included in the LEGO® DC Super-Villains Deluxe Edition or can be purchased separately for £11.99. For players that want to purchase the SHAZAM! movie DLC bundle separately, it will be available on 23rd April for £4.99. We all have a Super Hero inside us, it just takes a bit of magic to bring it out. In Billy Batson’s case, by shouting out one word—SHAZAM!—this streetwise 14-year-old foster kid can turn into the adult Super Hero Shazam, courtesy of an ancient wizard. In the movie, Shazam sets out to test the limits of his abilities with the joyful recklessness of a child, but he’ll need to master these powers quickly to fight the deadly forces of evil controlled by Dr. Thaddeus Sivana. The first SHAZAM! Movie Level Pack offers players the chance to master the powers of favourite characters based on the Shazam! film. Players will jump into the action and begin their journey as Billy Batson and Freddy Freeman to fight against the evil Dr. Sivana! The pack includes the ability for Billy Batson to transform into Super Hero Shazam, using his powerful abilities of flight, strength, projectiles, electric beam and more. Players can also see Freddy transform and take on Shazam powers, and unlock the four characters embodying the sins of man including Gluttony, Wrath, Pride, and Envy. These six characters will expand the main game’s already large roster of over 150 iconic DC characters. SHAZAM! 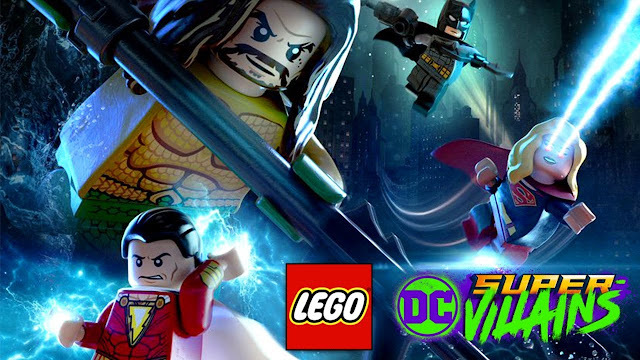 Movie Level Packs 1 and 2 are part of the Season Pass included in the LEGO® DC Super-Villains Deluxe Edition available on PlayStation® 4, Xbox One, Nintendo Switch™ and Windows PC.